March 1, 2016 – An international team of engineers deployed an Orion solar array wing inside the Space Power Facility (SPF) at NASA Glenn’s Plum Brook Station in Sandusky, Ohio on February 29. The deployment of the 24-foot wing qualification model was an important first step to verify Orion’s power system for the spacecraft’s first flight atop the agency’s Space Launch System (SLS) rocket, known as Exploration Mission-1 or EM-1, which will venture tens of thousands of miles beyond the moon. The solar array is based on the ESA (European Space Agency) Automated Transfer Vehicle’s X-shaped array of four panels. Together, the four panels will generate 11 kilowatts of power and span about 63 feet when extended. The array is a component of Orion’s service module, which is being provided by ESA and built by Airbus Defence and Space to supply Orion’s power, propulsion, air and water. The first of two wing deployments to take place in SPF this year, the test confirmed that the array unfurled properly and locked into place and that all of the mechanisms functioned as expected. Prior to deployment, the wing was held in a stowed position by four Kevlar straps. When an Airbus Netherlands test engineer issued the command for the wing to deploy, thermal knives cut the straps to release the array wing. The design includes two thermal knives for each strap for redundancy. After the wing deployed, Airbus engineers performed what they call a “glow test” to make sure the thermal knives heated as they should and activated simultaneously. 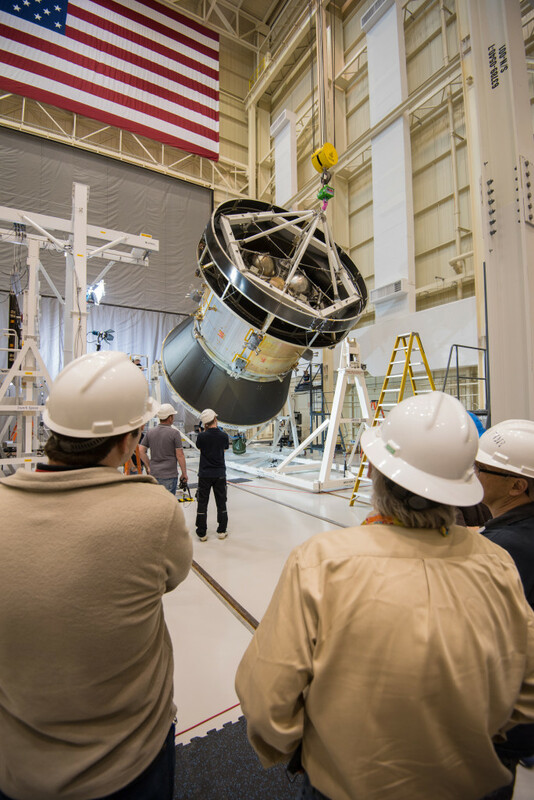 The successful deployment was the first in a series of crucial tests being performed at SPF to verify the Orion service module can withstand the harsh conditions of launch and ascent into deep space. SPF is the only place in the world that can subject the full-scale, flight-like test article to the conditions of launch and ascent. It is home to the world’s largest mechanical vibration table and most powerful acoustic chamber. Throughout spring and fall, engineers will use those facilities to mimic the shaking and noise the service module will experience during its ascent into space. They also will use pyrotechnics to simulate the shock the service module will experience during separation from the SLS rocket. 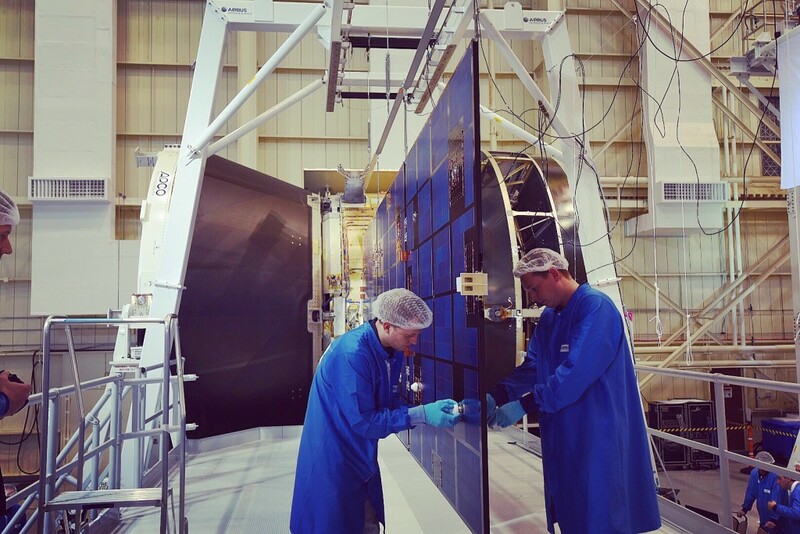 In early fall, they’ll conclude the campaign with another solar array wing deployment test. Months of preparation led to the successful deployment. As parts of the test article arrived from across Europe and the United States, the team meticulously inspected, stacked and assembled them. On February 20, they carefully tilted the test article — which includes structural representations of the service module, crew module adapter, and spacecraft adapter — to a 90 degree angle to position it for the deployment test. 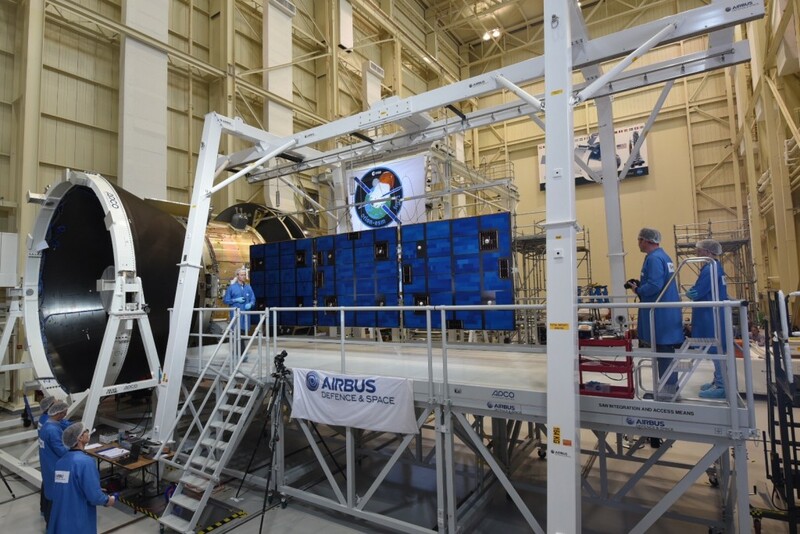 Last week, they attached the test wing, instrumentation and mass simulators to represent the other wings. With the first solar array wing test complete, engineers will waste no time preparing for the next test. This week, they will begin stacking the Orion crew module and launch abort system mass simulator on top of the test article and attaching the outer fairings in preparation for acoustic tests to begin this spring. The Orion spacecraft is being developed to send astronauts to deep space destinations, such as an asteroid placed in lunar orbit and on a journey to Mars. Lockheed Martin Space Systems of Littleton, Colorado is the prime contractor for the Orion spacecraft.